The Indian city Ayodhya recently once again turned into a saffron fortress. The BJP seems set to fight the 2019 elections by rallying its factions and allies to assert the Hindutva agenda and further politicising Hindu-Muslim relations. 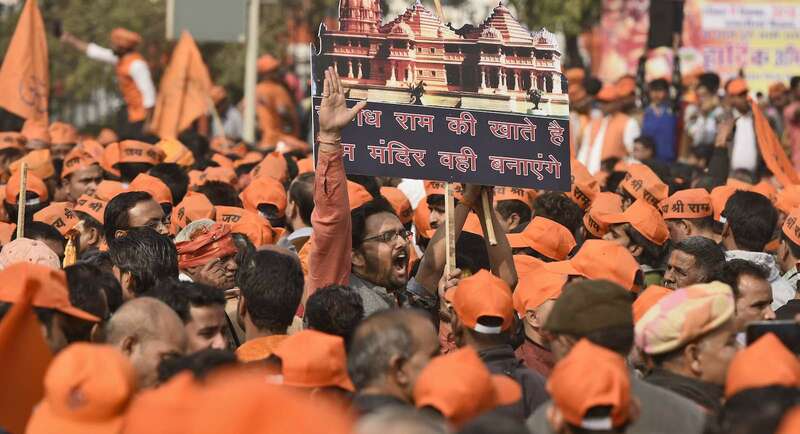 More than 50,000 supporters of the Hindu Right, particularly the Vishwa Hindu Parishad (VHP) and the Shiv Sena, besieged the city in recent weeks in an attempt to reignite the movement to build a Ram temple on the disputed Babri Masjid site. This self-anointed “Dharma Sabha” (Assembly of Righteousness) has demanded that the government pass an ordinance or executive order to escape a legal stalemate in the courts and start construction of the temple immediately. The tension in Ayodhya has been palpable. Nightmares of the violent riots that followed the 1992 destruction of the Babri Masjid remain in the city’s psyche. Many local Muslim families have reportedly left Ayodhya, threatened by the presence of these activists. Local Indian press have also reported that “five companies of Rapid Action Force personnel, anti-terrorism squads, 42 companies of Provincial Armed Constabulary and nearly 1,000 policemen have been deployed in the town,” while unmanned drones have been deployed to increase surveillance. The Bharatiya Janata Party (BJP), the ruling party in India and the political leadership of the Hindu Right movement in India, fought the 2014 general elections on the twin platforms of faith and development, manifested through the personality cult surrounding Prime Minister Narendra Modi. In the face of greater pressure due to the failure of its development agenda, the BJP seems set to fight the 2019 elections by rallying its factions and allies to assert the Hindutva agenda and further politicising Hindu-Muslim relations. The current positioning of the Ram Janmabhoomi issue with such increased fervour seems to be indicative of its electoral significance for 2019. Equally instructive of this is the BJP’s determination to continue fanning the flames of religiosity with regards to the Sabarimala Temple conflict in the southern state of Kerala. On 28 September this year, the Supreme Court ruled in favour of allowing women of menstruating age to visit the shrine at Sabarimala, whose deity Ayyappan is seen as being a celibate deity. Women of menstruating age have historically been barred entry to the temple. The ruling attracted criticism from many sections of the Hindu community in both Kerala and wider India that saw this as an affront to their religious beliefs and the deity itself. The BJP-led Sangh Parivar group, the self-appointed guardian of Hinduism, organised protests to prevent the ruling from being enforced. The BJP claimed it was merely defending the faith of millions of devotees and the sanctity of the temple’s customs, a curious position given Rashtriya Swayamsevak Sangh’s (a Hindu nationalist volunteer organisation that serves as the ideological backbone of the BJP) earlier support for women’s right to enter the temple. Having organised several debilitating strikes across the state in November, the BJP’s state chief, PS Sreedharan Pillai gleefully noted that “Sabarimala is a golden opportunity for the BJP.” The aim is to seize the political agenda in the state that has historically rejected the BJP as a political alternative to the Congress Party and the Communist Party, which have dominated the local political sphere since independence. There is also jostling within the family of Hindu nationalist organisations with connections to, or similar ideological underpinnings, as the RSS or the Sangh Parivar. The impending elections and the potentially precarious position of the BJP will be seen by the more hardline organisations as an opportunity to push a more muscular, aggressive Hindutva agenda. The VHP, Bajrang Dal, Shiv Sena, and other groups will view the coming months as an opportunity to set the tone for Indian politics to a darker hue of saffron. As such, the Dharma Sabha must be seen as a harbinger for greater mobilisation and potential violence. Yet these groups do not function as a collective monolith. The Dharma Sabha was masterminded by the VHP, though was boycotted by other prominent Hindu Right groups, including the Maharashtra-based far-right Hindu nationalist political party; Shiv Sena. Shiv Sena Chief Udhav Thackeray, during his visit to Ayodhya recently, threatened to circumvent the BJP government and begin preparation for the construction of the temple. This is reflective of the Sangh Parivar’s increasing internal tensions with regards to how to address the Ayodhya issue, and the BJP’s inability to forge a consensus within this family of organisations. The BJP is finding it increasingly difficult to reconcile its position as the prophet of a Hindu Rashtra or Hindu nation (a romanticised ideal in which all Indians look to India as their Holy land) with the necessity to project an image of inclusive development and growth. The coming months will see greater rivalry and impetus from different Hindutva factions to set the agenda for the Sangh in 2019. The response of the Congress to the Dharma Sabha in Ayodhya has been muted and very much in step with its shifting agenda. The Congress has consistently accused the BJP of exploiting vote-bank politics, however, they seem to be mirroring the BJP’s communal strategy, albeit under a different guise. Under attack from a dominant Hindu Right that has accused it of being anti-Hindu, pro-Muslim, and against the building of the Ram Temple, the Congress party has recently attempted to showcase its Hindu credentials rather than attacking the communal politics of the BJP and position itself as the protector of the secular Indian state and the Indian constitution. On the issue of the Ayodhya temple, Congress has denied it stands in opposition to the construction of the temple. A Congress leader, CP Joshi even argued that only a Congress government would be able to deliver the building of a grand temple in Ayodhya. In Kerala, the Congress party has disagreed with the Supreme Court’s decision on Sabarimala and has staged protests, aping the BJP’s position on the issue, arguing that the sensitivities of the Hindu community have been ignored by the ruling. Along with the Congress Leader Rahul Gandhi’s newfound penchant for publicised visits to Hindu temples, the Congress Party seems to be increasingly embracing a Hindu hue to its politics which has led to commentators dubbing it, “soft-Hindutva”. The Dharma Sabha must be seen as an omen of a shifting agenda in Indian politics. The BJP and the Hindu Right seem poised to embrace a more hard-line communal agenda in preparation for the 2019 general elections. The Congress Party in response seems willing to recalibrate its approach to a more conciliatory, “soft-Hindutva” approach. Either way, the divisive policies adopted by both the BJP and Congress paint an unnerving picture for the future of Indian politics. It is increasingly likely that the 2019 elections may no longer see an ideological battle between secularism and communalism, but rather clashes between different hues of saffron.